Has this ever happened to you – you travel often and Wi-Fi connection stinks, if there is any at all? It’s nerve wrecking…especially if those reports are waiting to be finished ASAP. 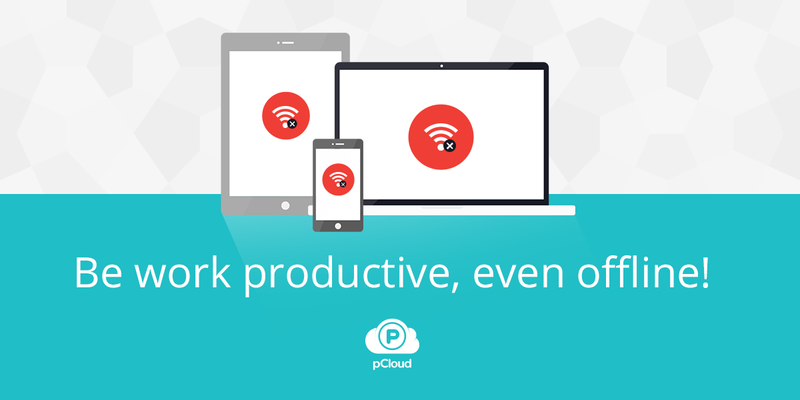 Thankfully, pCloud is still operational offline, so you can be work productive either way! You will be surprised at how handy a smartphone can become for your work! It may be your dedicated “Productivity” playlist or the agenda for your next meetup – ensuring offline access to your data in the cloud will definitely contribute to a good business trip. pCloud’s mobile app for Android and iOS has just the thing – Offline access. Adding offline access to your data is the same as temporarily downloading it on your phone. By doing so, you can view and play any piece of information offline. Goodbye failing Internet connection and hello work ready documents. If you’re using your laptop as your main power tool, then you may want to download pCloud Drive before you go offline. Why? Because it gives you all the perks cloud storage can offer. This advanced desktop application acts as a virtual drive or otherwise said – it gives you full access to up to 1 TB of space without taking any from your PC. And what’s better, it allows you easy offline access to your data when you need it! If you want to be able to view and edit any document directly from the cloud, right-click and choose “Sync”. This will give you the ability to modify any file with your favorite apps.When your Internet connection is up (active) again, each of the changes you have made will be synced with your mobile device and web, so you get the latest versions of your files any time. We’re living in the digital era, so our Wi-Fi is as vital as our morning cup of coffee. Having the right app with you, however, can ensure you are work ready and capable, offline. Allow pCloud to help you with the successful start of your next project! Save yourself time and beat any deadline that comes to you with our additional features and pCloud Business!